Abstract: Uppermost Jurassic and lowermost Cretaceous dinocyst successions calibrated against ammonite and foraminiferal zones were studied in five sections from North Siberia, the Subarctic Urals and the Russian Platform. Together with analysis of published palynological material on additional contemporaneous sections from the Russian Platform, our research provides a reliable regional correlation. The obtained biostratigraphic results are compared to palynological data from different regions of Europe, America, Australia and Antarctica using the method of first/last appearances of selected key species and evolutionary trends of dinocyst floras. Four correlative levels are defined in the middle parts of the Volgian and Berriasian and near their tops providing interregional correlation of dinocyst successions. These levels range within 1–1.5 ammonite zones as the first/last appearances of some key species and minor stratigraphic shifts in different sections that may be related to migration processes or to a different understanding of the stratigraphic position of ammonite zones. Abstract: The genus Bronnothyris, with the type species Terebratula bronnii Roemer, 1841, was erected for those Argyrotheca species that have septal flanges extended ventrally from the dorsal valve. Four other Late Cretaceous and one Early Paleocene species were attributed to this genus (i.e. Argyrotheca coniuncta Steinich, 1965, A. lacunosa Steinich, 1965, A. obstinata Steinich, 1965, A. stevensis Nielsen, 1928 and A. rugicosta Zelinskaya, 1975). After examination of Oligocene material from Waldböckelheim, Mainz Basin, Germany we transfer the species Argiope subradiata Sandberger, 1862 into the genus Bronnothyris. This new combination extends the stratigraphic range of Bronnothyris into the Oligocene. Abstract: This is the first record of a bathyal mollusc fauna from the late Early Miocene of the Central Paratethys. The assemblage shows clear affinities to coeval faunas of the Turin Hills in the Mediterranean area and the Aquitaine Basin in France. The overall biostratigraphic value of the assemblage is hard to estimate due to the general very poor knowledge of Miocene bathyal faunas. Several species, however, are known from deep water deposits of the Middle Miocene Badenian stage as well. This implies Early Miocene roots of parts of the Middle Miocene deep water fauna and suggests a low turnover for bathyal mollusc communities at the Early-Middle Miocene boundary. The nassariid gastropod Nassarius janschloegli Harzhauser nov. sp. and the naticid gastropod Polinices cerovaensis Harzhauser nov. sp. are introduced as new species. Abstract: Two main Miocene facies were recorded in the Gulf of Suez area: a deep marine and a coastal facies. The analysed sections in the Wadi Sudr area belong to the marine facies. The Lower Miocene (Burdigalian) is represented by coastal, shallow marine sediments, rich in coral, algae, gastropods and large pectinids followed by Langhian open marine sediments and Serravallian lagoonal carbonates. The open marine sediments contain well preserved planktonic and benthic foraminifers and abundant ostracods. The parts of the sections containing foraminifers have been correlated with three planktonic foraminiferal zones (Praeorbulina glomerosa Zone, Orbulina Zone and Globorotalia praemenardii–Globorotalia peripheroronda Zone). Two benthic ecozones were defined (Heterolepa dutemplei–Laevidentalina elegans Zone and Bolivina compressa–Elphidium spp. Zone). Two cycles of sea-level changes can be distinguished and correlated with global sea-level cycles Bur5/Lan1 and Ser1. The first (Langhian) cycle culminated in open marine sublittoral to upper bathyal well aerated sediments. The second (Serravallian) cycle was shallower, littoral suboxic sediments were overlaid by euryhaline carbonates. The studied foraminifera-bearing sediments can be correlated with the lower and Middle Badenian of the Central Paratethys. Though the area of the Gulf of Suez and the Central Paratethys were situated in different climatic zones, and influenced by different tectonic events, the main paleoenvironmental events (sea-level changes, oxygen decrease, salinity changes) are comparable. This correspondence shows that the decisive factors triggering these events were global climatic events. 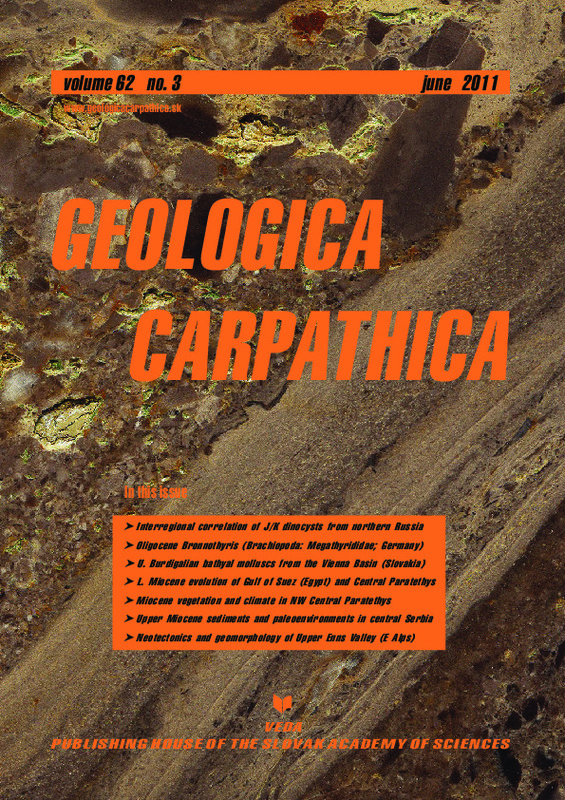 Abstract: The case study area covers the slopes of the tectonically quiet European platform and foreland of the tectonically active Carpathian mountain chain (Carpathian Foredeep and Vienna Basin). Therefore the research on pollen spectra mirrors not only the evolution of landscape in two areas with different geodynamics, but also climatic changes in the Central Paratethys domain during the studied time interval. According to the pollen data, the Early to Middle Miocene vegetation reflects subtropical climate with very mild (negligible) cooling events during this period. This is indicated by common occurrence of thermophilous taxa in the whole sedimentary record. The Middle Miocene landscape evolution, conditioned by uplift of the Carpathian mountain chain and subsidence of adjacent lowlands, led to commencement of the altitudinal zonation. The terrestrial and aquatic ecosystems confirm a subtropical climate (Miocene Climatic Optimum, Mi3 event) with some possible long term changes in humidity. The Late Miocene paleogeographical changes, but also general climatic oscillations in the northwestern Central Paratethys realm, resulted in decrease of the number of thermophilous taxa during this time (change in latitudinal position of the vegetation cover). Variously high mountain relief of the uplifted mountain chains (altitudinal zonality) created ideal conditions for mixed mesophytic forests (to open woodland — open grassland type), still with presence of evergreen taxa. A subtropical climate with gradual transition to warm temperate climatic conditions is supposed on the basis of the reconstructed vegetation cover. Abstract: The Late Miocene sublittoral marls of the Pannonian Stage (the long-lived Lake Pannon) were studied. From neotectonic point of view, the investigated area represents a natural border between two different morphostructural domains: the Pannonian Basin to the north and the Peri-Pannonian Realm to the south. More than 20 mollusc and 34 ostracod species were identified which indicate the upper part of the Lower Pannonian and the lower part of the Middle Pannonian (“Serbian”) predominantly. The identified dinoflagellate cyst assemblage (21 taxa) hinders assignment of the studied samples to a Pannonian substage but supports the high endemism of the Pannonian flora. The lithostratigraphical, paleontological, and paleoecological analyses indicate a mesohaline (8–16 ‰), sublittoral (<90 m deep) environment of the early Lake Pannon. The estimated stratigraphic range for the investigated deposits is 9.8–11.4 Ma. Abstract: The geomorphology and neotectonics of the Upper Enns Valley (Austria) in the Eastern Alps reveal the formation of a fault-controlled orogen-parallel valley. In the study area, the Eastern Alps have been under surface uplift since Early Miocene times. Quaternary processes such as uplift and cyclic glaciations likely interfere with neotectonic activity as the Upper Enns Valley follows the Salzach-Enns-Mariazell-Puchberg (SEMP) fault. The geomorphologically different landscapes comprise three main tectonic units: (1) the Austroalpine crystalline basement exposed in the Niedere Tauern, (2) the Austroalpine Paleozoic units (Greywacke Zone) and (3) the Dachstein Plateau dominated by Triassic carbonate successions. The Upper Pleistocene Ramsau Conglomerate overlying the Greywacke Zone on the northern slope of the Upper Enns Valley is a crucial element to reconstruct the evolution of the valley. A new 14C date (uncalibrated) indicates an age older than 53,300 years, outside of the analytical limit of the methods. Provenance analysis of the Ramsau Conglomerate shows the Niedere Tauern as a source region and consequently a post-early Late Pleistocene dissection of the landscape by the Upper Enns Valley. Paleosurfaces at elevations of about 1100 m on the northern and southern slopes of the Upper Enns Valley allow us to estimate surface uplift/incision of about 2.5 mm/yr. Regularly oriented outcrop-scale faults and joints of the Ramsau Conglomerate document Pleistocene to Holocene tectonic deformation, which is consistent with ongoing seismicity. Paleostress tensors deduced from slickensides and striae of pre-Cenozoic basement rocks indicate two stages of Late Cretaceous to Paleogene deformation independent of the SEMP fault; the Oligocene–Neogene evolution comprises NW–SE strike-slip compression followed by E–W compression and Late Pleistocene ca. E–W extension, the latter recorded in the Ramsau Conglomerate.